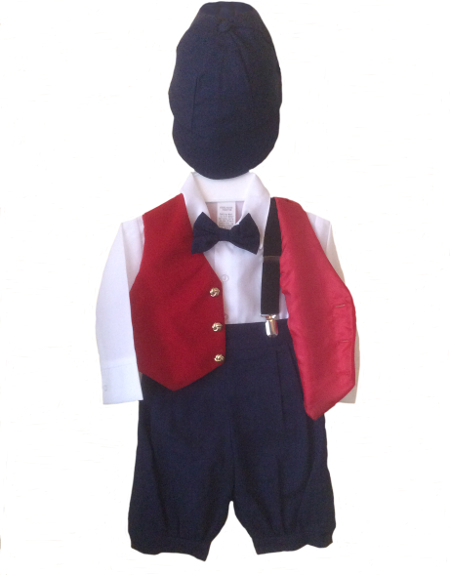 DapperLads - *Exclusive* Be Mine Navy Knicker Set With Red Velvet Finish Vest - Knickerbockers - US made Victorian fashion boys knickerbockers sets with genteel nostalgic appeal. Picture Perfect! This exclusive DapperLads Design has arrived just in time for the holidays and it is adorable. This outfit brings a vintage style to the season and can be worn for everything from caroling to a sumptuous Christmas dinner with the family. The 6-piece set includes navy linen polyester knickers with an elastic back, a 65%-35% cotton-poly blend long sleeve white shirt, a navy linen clip-on bow tie, dark blue suspenders , a red velvet finish vest, and a navy pie cut cap with elastic in the back. Note: The suspenders are slightly lighter blue than the navy of the knicker set. Refer to the height / weight chart and order up if near the top of a size and choose carefully. Available in infant sizes 12, 18 and 24 months.